“Every time things pipe down around here, it’s because there is something consuming going on that I’m not ready to share with the Internet yet. In this space, I share my thoughts and observations about the world. It follows, then, that when my world is permeated by a thing I can’t share, there is radio silence. A dear friend from college wrote these words in her very own blog post not long ago, however they have resonated with me ever since. As I get settled in for my third year here in Ghana, I look around and see all of the new teachers so excited about getting to know this place that I’ve grown to call my home. I am reading their blog posts about “firsts” here in their new country. It takes me back to my first year where I was very diligent about keeping friends and family updated back home via my blog posts. I realized that I DID NOT Write. A. Single. Blog. Post. Last. Year. Now in my defense, I did do a fairly good job of at least posting pictures on instagram that automatically rolled over to Facebook, so don’t get greedy people. I tried. Last year was rough. I will not go into great detail because it is unnecessary at this point. The point is that despite last year’s chaos abounding, God is good and is doing a new work in my life and those around me. Refinement is always a difficult yet rewarding process. All that to say it was not you, it was me! I apologize for our temporary break up but I have thought it over and our relationship is worth fighting for. Yes, you and me and the rest of the creepy people who might click on this title hoping for a juicy story about my love life 😉 With that said I promise to try and do some great updates this year on my life here. Many apologies for the radio silence last year but I promise to make up for it by flooding your inboxes with updates this year. 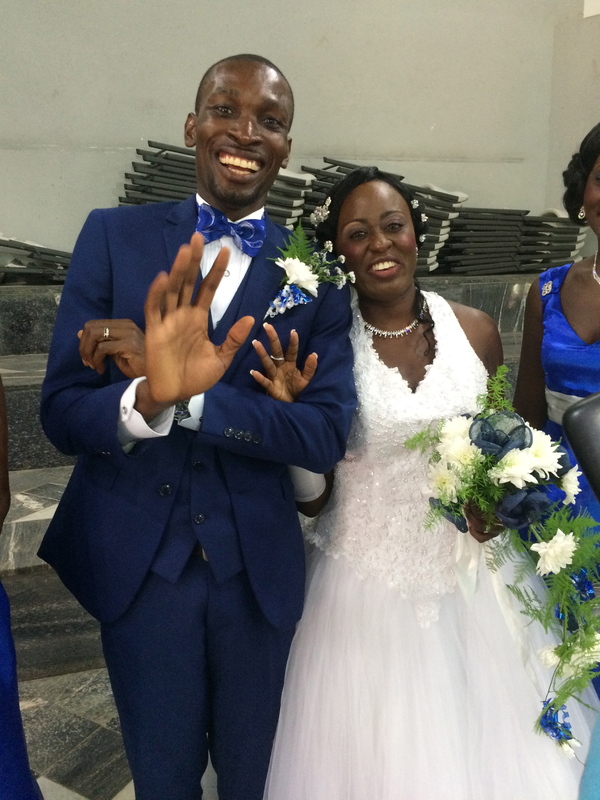 My friends Lilian & Walter got married soon after I returned to Ghana. 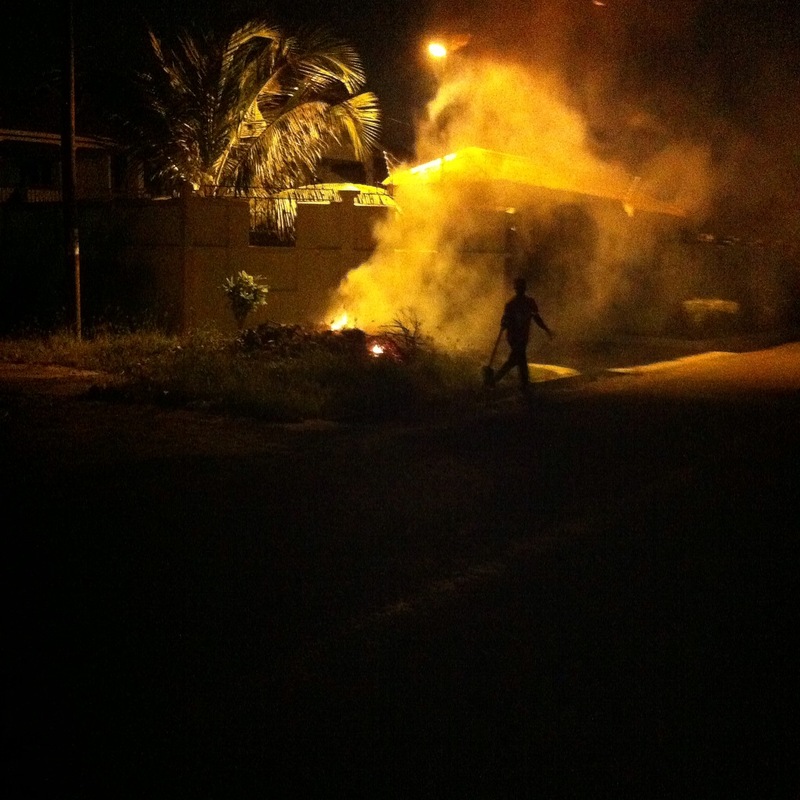 The trash burning across the street. Photo credit goes to Kate for this beauty. 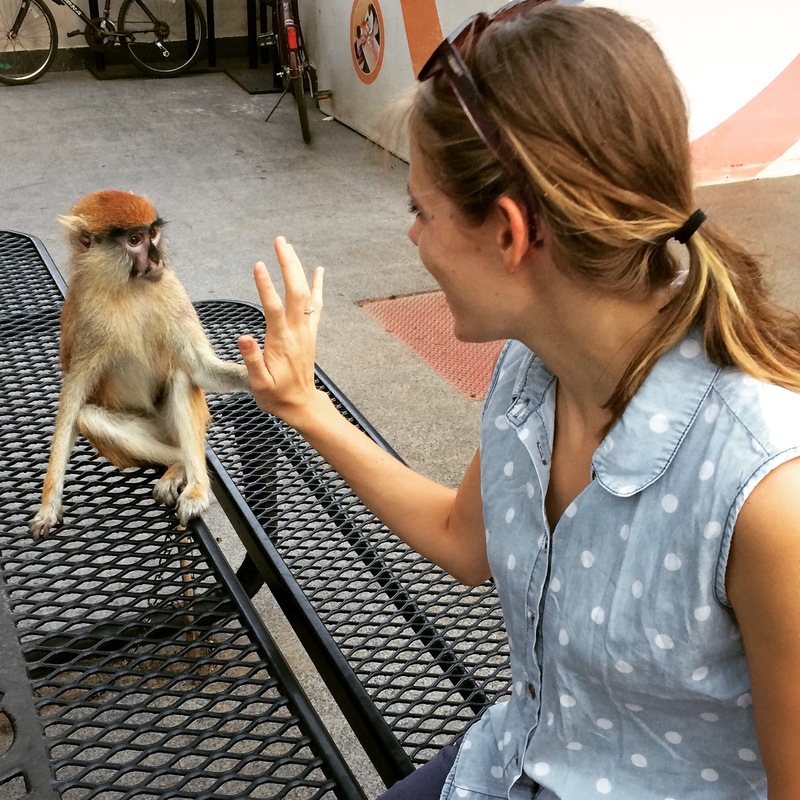 Kate became best friends with a monkey that I named Abu. Oh you know me and the neighborhood squad! 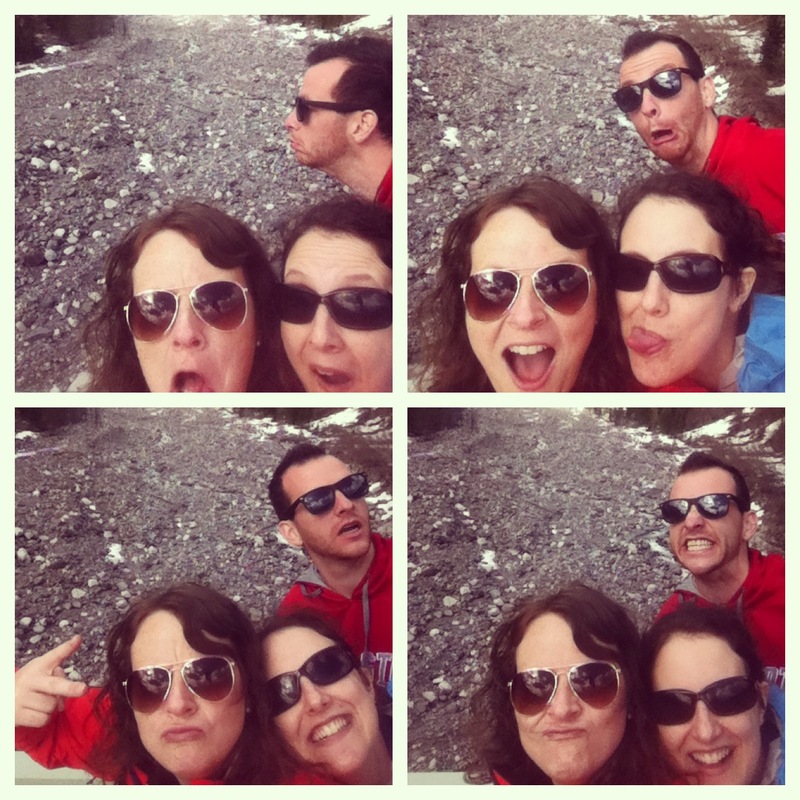 More selflies with the crew! Solomon’s face cracks me up when he makes all kinds of goofy looks. Solomon found some awesome styrofoam that he dragged home so he could have his own personal recliner chair. His sister wanted to make it a push-cart. 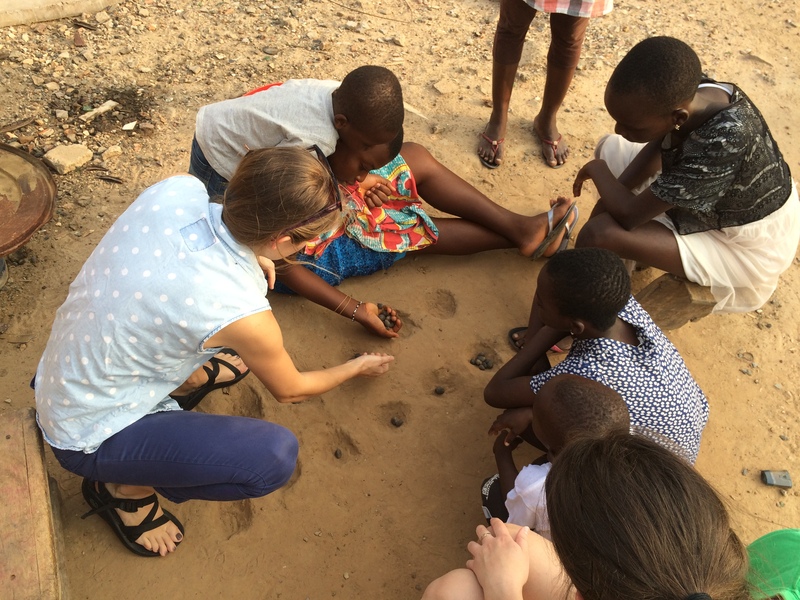 The kids made their very own Oware game board, or as our friends in America call it, Mancala. 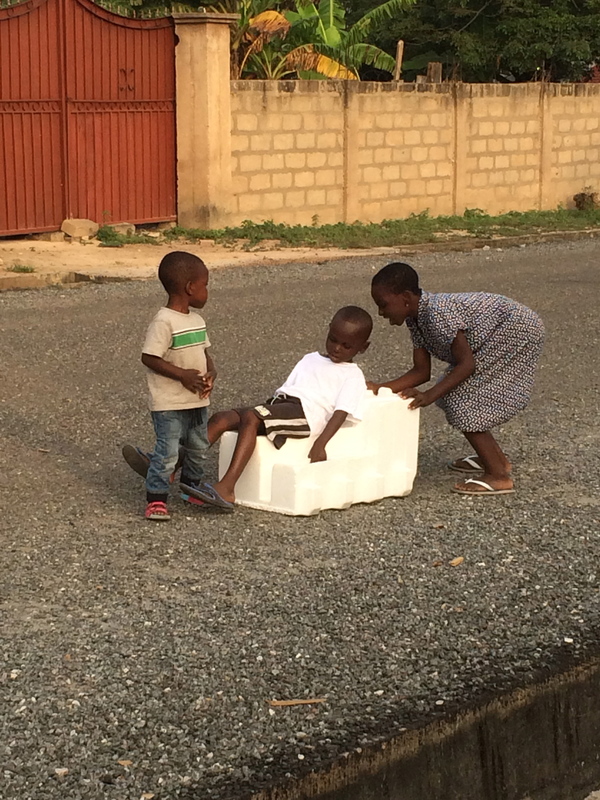 It’s a simple stone moving game, but it is considered the game of Ghana, other than soccer of course. First week of school was so smooth and peaceful! So great seeing all of our students again. 26 amazing people celebrated Kate’s 26th birthday! 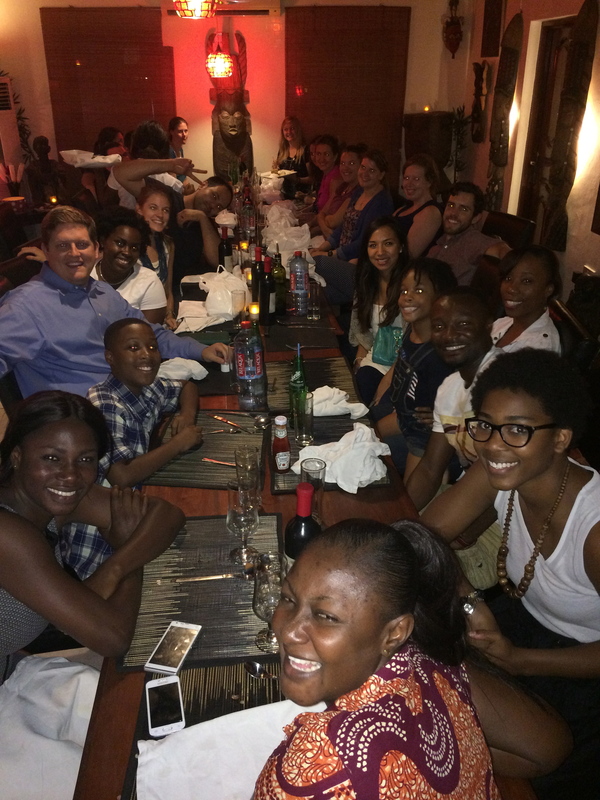 We reunited with our Ghanaian family. So good to see Paulina & the kids again. 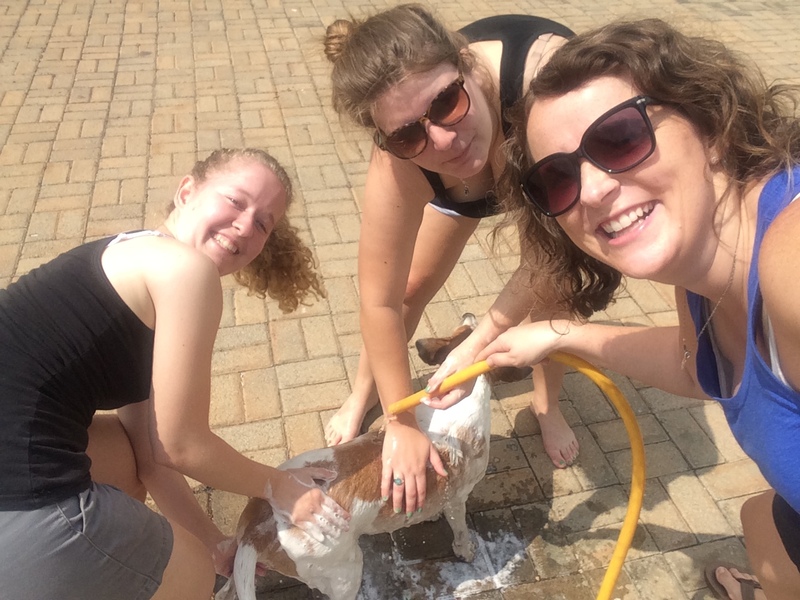 Momo got his first bath in probably…well it just seemed like it had been a while! We were gone too long because he missed us all something fierce to not put up a fight for a bath. “Speed Dating” during teacher orientation week. 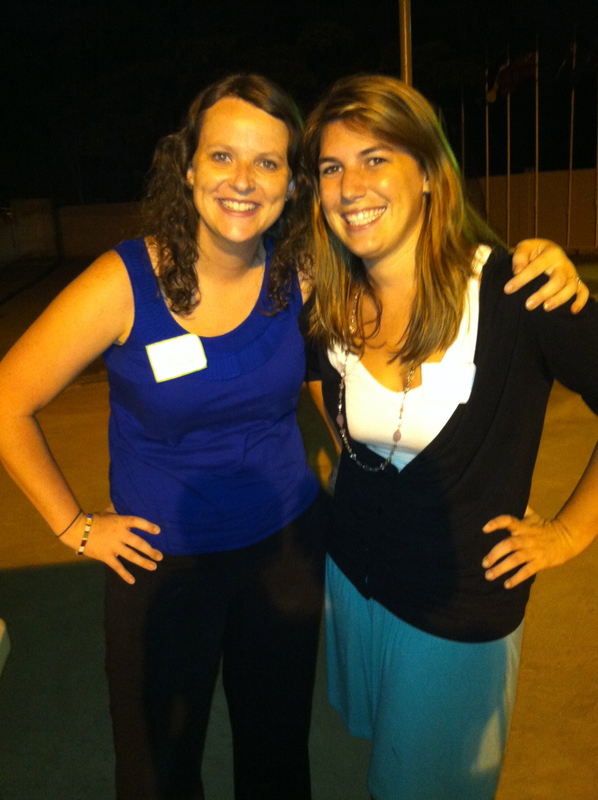 It has been so great getting to know the new folks at AIS. – Thanks for the continued love and support. I promise there will be less radio silence. Before you go thinking this is a waste of time because of the title and you are probably thinking: “Well Heather lives in Africa, she should be used to no water,” please let me shed some light on the situation. We have exactly two massive black poly tanks that hold water. These water towers are sometimes our main source of water and most times our reserve of water, if for some reason the “city” water gets shut off. One of our poly tanks feeds into the other, so at any given time one or the other should have water. With all of that being said the other day one of our roommates texted us all to inform us that we were officially out of water. Both poly tanks were empty; city water had been shut off for more than a few days now. Gone. Nothing. Not. A. Drop. This is Africa so we roll with it, right? Wrong! You would think by now that living in Africa has brought me to achieve an all time amount of humility in life, and truth is most days I am humbled and simply grateful for a new day. In fact I always tell people back home that living in West Africa definitely keeps me humble and less reliant on myself. Oh how the Lord is probably laughing right now for that comment. Somehow even amongst waterless, phasing power situations, a bout with malaria and typhoid, and unreliable Internet, my puny little sinner human self-righteous self still feels like I am owed something in this world. Entitled is the word I use with my students often. Our roommate in her informative text also said: “Can one of you please find out how we can get some more water?” (She was sick with Typhoid so don’t go thinking, “Why didn’t she call someone to do something about it.” Trust me if you have had Typhoid, you wouldn’t be moving much either and you would pray that water returned quickly for the sake of using the restroom). What did we proceed to do, (well my roommates proceeded to do because I had the attitude of well this is Africa it will sort itself out eventually or I will just deal with it when I get home); they began to try and find a solution. As humans I believe we have this “fix it” nature. Not just guys but girls too. We always want to find a solution to the problem or fix our mistakes. My best friend is this way, she is constantly looking for a more efficient way to do things, fix a common sense issue, or find a solution to my simple venting of how my day went. I think this is just how we are wired sometimes. Usually I error on the laissez faire, fly by the seat of my pants, free spirit mentality (or so I have been told this by my family) and usually not much phases me. Notice I said “usually.” Oh how I am human too. My roommate informed me that they were calling a water tank truck to come deliver a full tank of water to our house. This truck looks much like a gasoline tanker truck, however it holds water and they pump it into your poly tanks. 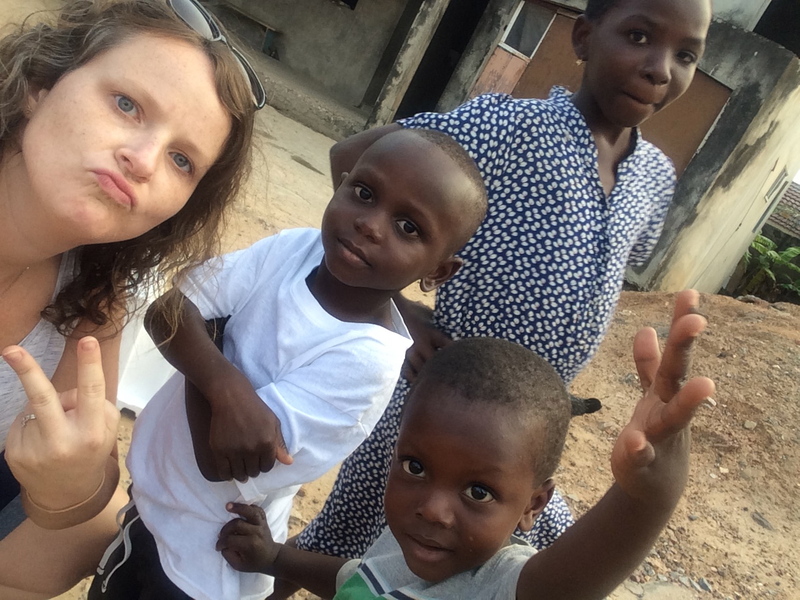 She informed me that it costs us 100 Ghana Cedi (about 50 USD…well a little less than that due to always changing exchange rates, but that is a different blog post) and we would split it 4 ways. Problem solved. AWESOME. By the time I got home that night after coaching girls soccer practice, my roommate had texted everyone and said we have water. I was excited because I smelled like a middle school boy who had not discovered deodorant yet because I had practice that day with my girls. However when I got home my sweet roommate Laura was preparing to do laundry with our new found water, and when she ran the water it started to fill up brown. BROWN. MURKY. DIRTY. CUP OF TEA COLORED. BROWN. I quickly ran into my bathroom to run my tap water and sure enough, yep, brown there as well! I went to bed that night feeling restless. I woke up at 12:05 a.m. to the sound of what I thought was the world ending, only to realize that it was RAIN! Real, fresh, pounding the ground rain. We had not had rain in a very long time. When it rains on our roof it is so loud and glorious. I literally could not fall back asleep because the sound was so amazing. I was in awe. I tried recording it to post on here but when replayed it merely sounds like a sound machine for a toddler’s bedroom. Lying awake from the glorious rainstorm at 12:05 a.m. is when this revelation came to me: “Why did we not simply wait for the rainstorm to pass.” Our human selves decided that we needed to fix the problem and fix it now, and where did that get us? With murky, dirty, brown water, that is where it got us. Instead we could have waited out the storm (which we had seen coming all day), and allow our tanks to be filled with clean and fresh rainwater. Instead we were stuck with a 100 Cedi worth of water, also known as two giant black poly tanks full of murky, dirty, brown water, until it runs out. This has been the theme in my life lately. (Despite me being a school counselor and professionally being required to help children and older students fix their problems) Too often I have been the one trying to fix something whether it involves my job, my students, my friends and the problems they voice to me, issues back home, you name it and I am pretty sure I have tried to fix it or come up with a solution. I can tell you where it has led me, to murky, brown water. What I need to be doing is resting in God’s truths and waiting patiently for the rainstorm to pass. My tank will in return be full again with fresh and clean rainwater. I am not sorry we hopped on the honesty train there for a minute and I got all serious and not my typical humorous tone, I want others to know that we do not always have to try to fix everything on our own. The truth from this is that we need God; we cannot do this life alone because it will lead you to brown, dirty, murky waters. You will get restless, you will be drained, you will feel like you are in a funk 24/7, you will become a doormat, you name it, insert depressing feeling here. The moment we start trying to do it all on our own, we fail big time. Surrender. Surrender yourself to the Lord and draw close to Him. If you are not sure how, please holla at a sister and we will talk real life. It is tough, but well worth it. Keep leaning in and keep saying yes to the Lord’s promptings in our lives. Stop trying to handle your business all on your own. Stop taking everyone else’s business upon your shoulders and trying to find a solution. Rather rest in the Lord, His truths, and His promises, and surrender these things, situations, people, relationships, jobs, etc. to the Lord and see how He works in and through you. P.S. – No worries my typhoid is 100% better now, as is my roommate. 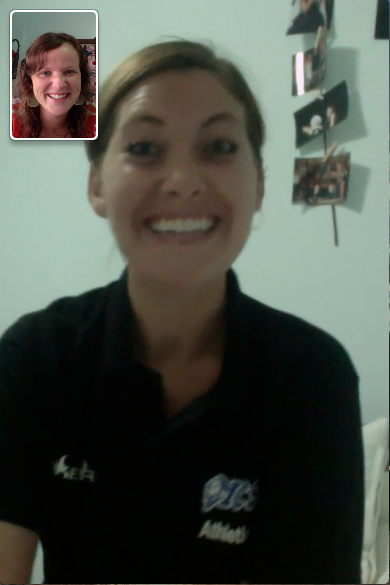 The first member voted off of Survivor: Ghana is… dramatic drumroll…Heather O’Hara! Just kidding! I wish that I could say that our two week J Term survivor course was just as dramatic as the t.v. show however…well I take that back there were definitely dramatic moments and I definitely wanted to vote a few people off the island at times haha but we made it! 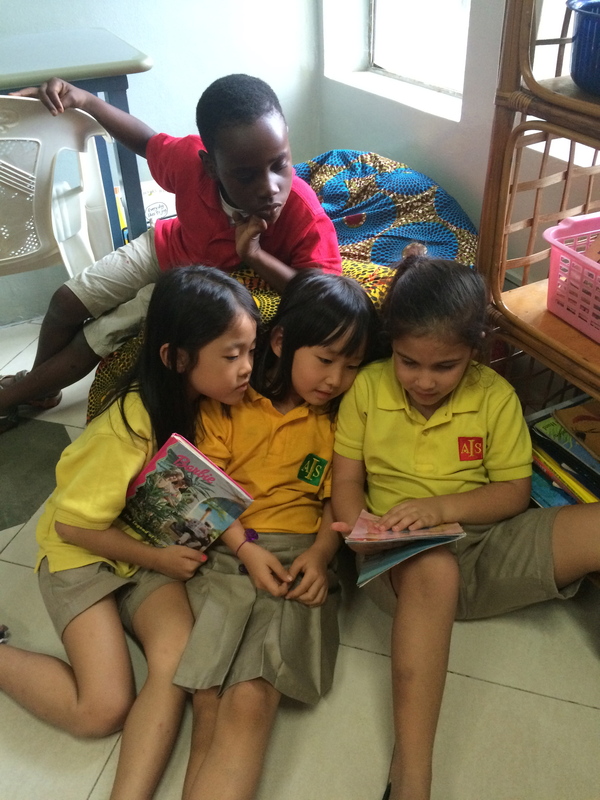 J Term is an awesome thing that American International School does for the first two weeks of the second semester. Students get to choose what course they want to take for two weeks. Teachers get a change of pace as well because we get to teach courses that we normally do not have the privilege of teaching year around. I co-taught the Survivor course with Andy & Josiah. We had 15 students in our course. Two weeks, with two overnight camping trips and a lot going on in between. Many more life lessons were taught in between all of those bigger things. 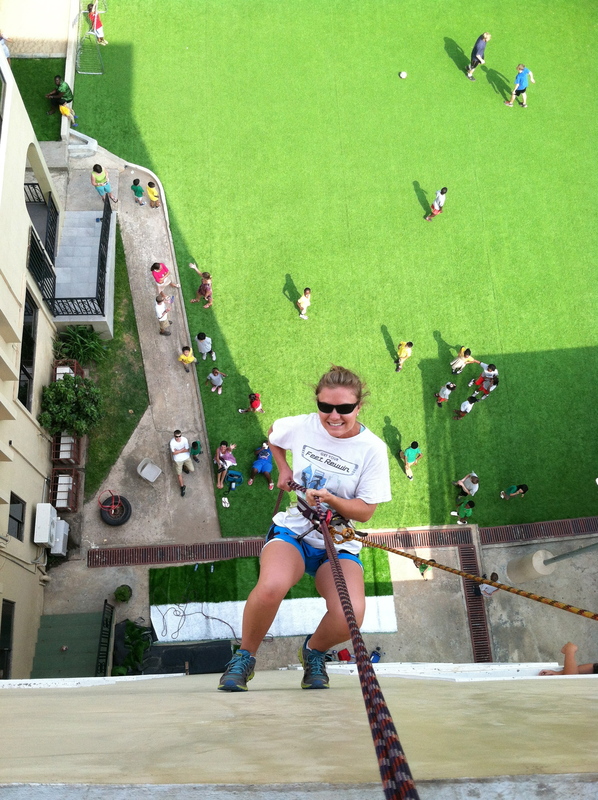 Below are some pictures from the past two weeks…Enjoy! Oh and P.S. – Just because Bear Grylls did it, does not mean you have to! Two of our students decided to drink their own urine for bonus points for their team. 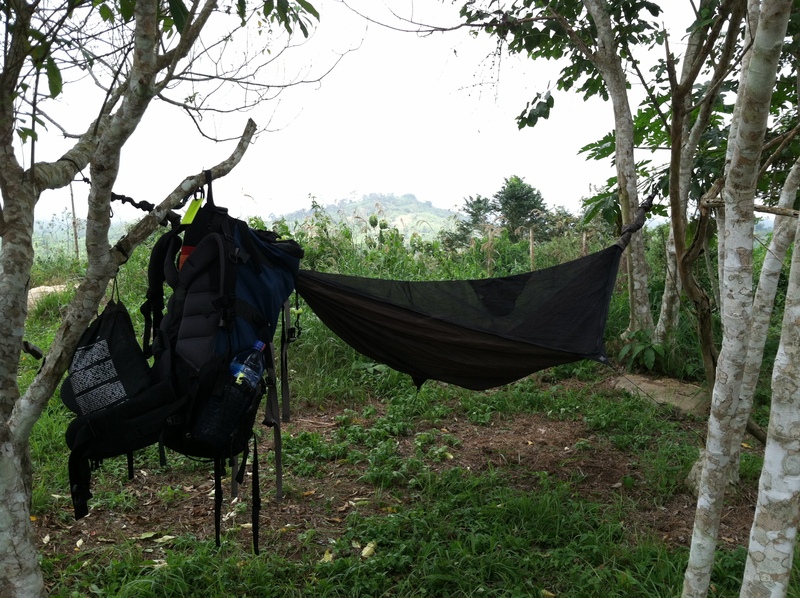 I reminded the students that Bear was alone wandering in the Sahara desert, not camping on top of a mountain that we hauled water sachet drinking pouches to. Oh middle school students. Gotta love them. This was my view from the last camping trip…not to shabby! We don’t have a lot of fresh air and green in Accra so it was nice to be out of the ordinary and on top of a mountain. Our motley crew! Had a blast getting to know theses students over the past two weeks. 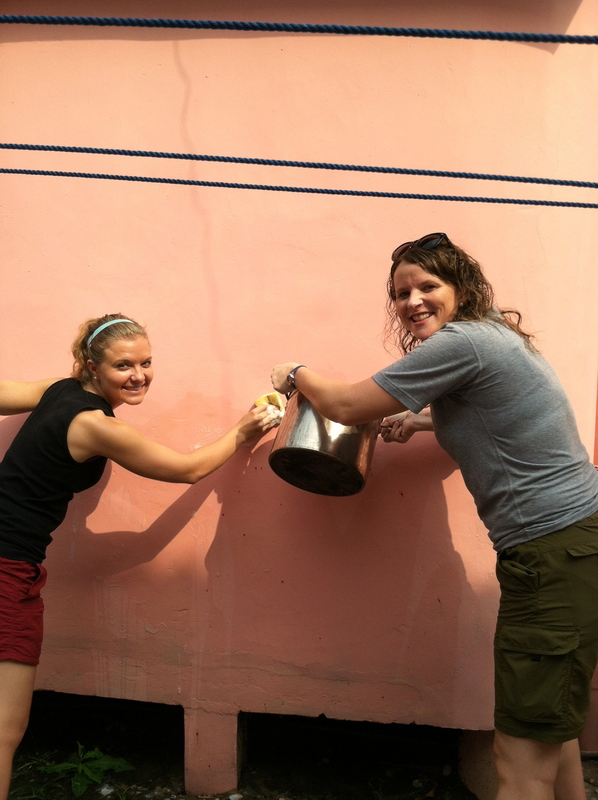 Real friends help you scrub guinea fowl blood off the walls of your house because you volunteered to do the demonstration at your house because it is right next door to the school…Natalie you saint you! So how do you repay your best friend for helping you scrub blood off your house after the killing of the guinea fowl..you throw her off the 6th floor of your school building during the rappelling lesson. 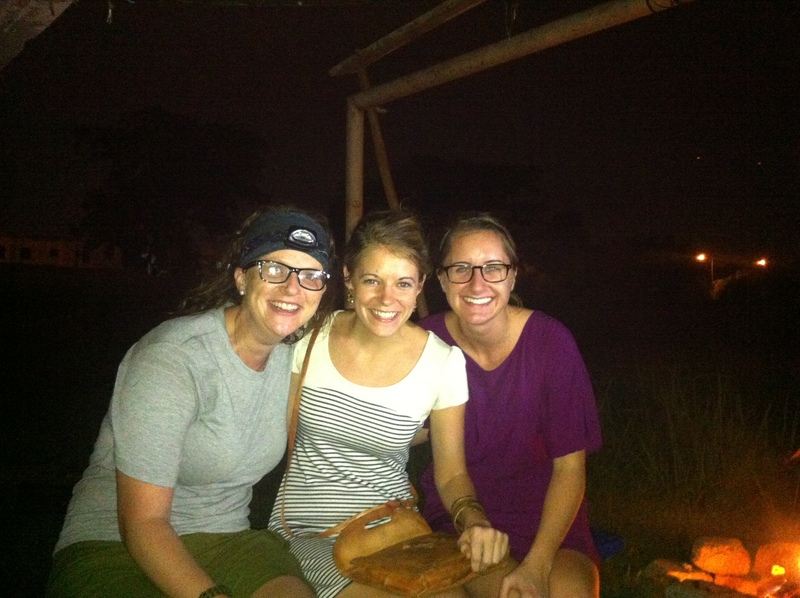 The real friends train continues…Real friends leave a wedding reception with some of the most prominent people of Ghana to sneak into your campout and bring you chocolate cake. Mad props to Mallory & Kate for taking a taxi to the campout location and dropping me some goodness. Cake never tasted so good after killing and eating guinea fowl for dinner with a combination of pasta and anonymous beans and corned beef. Yes they look stunning, and no I am not a homeless coal miner. Ladies I am forever indebted to you. 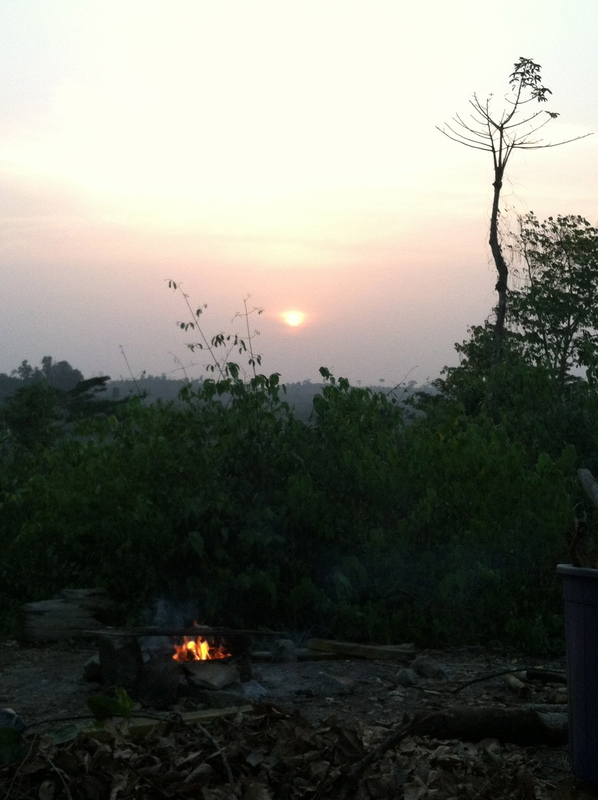 The gorgeous sunset over the campfire during our final campout. Overall it was a great experience and I was so thankful for the opportunity to get to know a different group of students than I usually work with. It was great to teach other things out of my ordinary college prep and psychology courses. 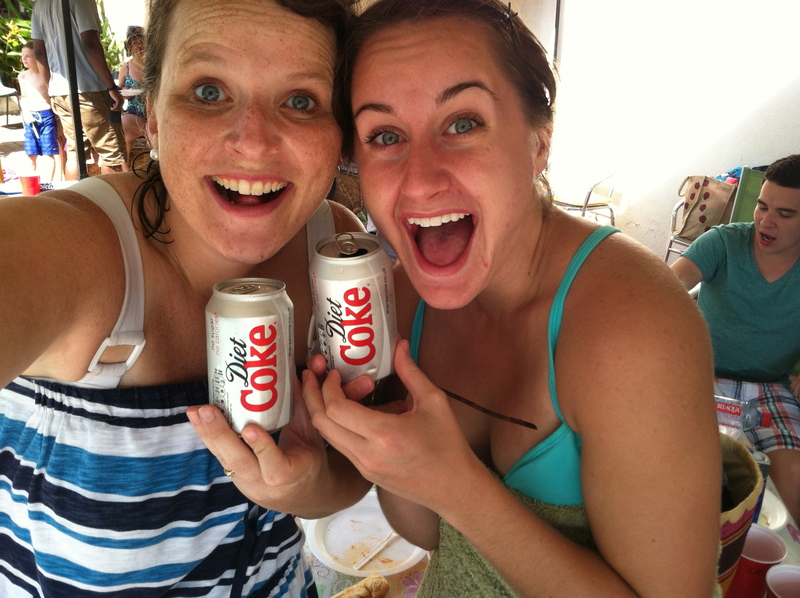 We had a blast doing life together for two weeks and I look forward to J-Term next year. Ghana (and the Lord) has a way of keeping me humble. Last week I was making breakfast for dinner with my roommates and best friend Natalie. We had just got done discovering that somehow the bugs had managed to get through the Ziploc bag that was double layered and into the box of pancake mix. No worries called the roommates and another one of mine had a different box, we opened that and yahtzee…no bugs! I was having a rough day and turned to Natalie and said, “Today I would just like Africa to be easy.” Literally 10 seconds after “Easy” came out of my mouth the power went out and did not come back on for a while. We looked at each other and laughed. There was nothing we could do. I literally yelled out “OK I GET IT GOD THANK YOU FOR KEEPING ME HUMBLE AND DEPENDANT ON YOU, THANK YOU, EVEN FOR THIS DISRUPTION.” Natalie and I just continued to laugh at the situation. We busted out the headlamps; got the matches out to light the gas stove, and proceeded with dinner preparation. 3) My co-workers no matter how many times I told the story or quickly reminded Kate that I still had a bruise from her (which was every opportunity that presented itself), it seems like everyday since the football game and different co-worker still had not heard the story, which led to me re-telling it on many different occasions at staff meetings and gatherings. In other news I went to Cape Coast this past weekend with some sweet friends and had an amazing time just being removed from the daily hustle and bustle of Accra. More to come on that later in the next post regarding the slave castles, canopy walks, and beach camping. Looking forward to seeing some of you all in two weeks when I am in the States for 12 days for Christmas. Today is my last morning in South Africa before heading back to Ghana. My friend and I went to the mall to pick up a few last minute things. You know the kind of things you want to smuggle back into a country that charges way too much for granola bars, toiletries, gum, candy, you name it and just about everything costs more in Ghana. Then it happened. We turned the corner and it hit me like a fat kid getting hit in a game of dodgeball. There was no turning back. I wanted it NOW. I was not getting on the plane back to Ghana and not getting this slice of heaven. I was the equivalent of a pregnant woman not settling for anything less than her craving of pickles and peanut butter. Backstory: Ghana has NO GOOD DESSERTS! I have yet to find a place with a dessert that was worth writing home about (or even a blog post), meanwhile all my friends at the other NICS schools are posting pics of precious coffee shops and glorious homemade creations (You know who you are). So back to the story, there it was like a bug zapper drawing luring in its prey. Like a lamb being led to the slaughter. Like a….ok well you get the idea. It was attractive and I had not seen it in nearly 6 months or more. It was not even something I ate regularly back in the States but today, everything changed. I. WANTED. IT. NOW. Up went the gate as they opened and there went my wallet. I was scrounging through my leftover South African Rand to see how much I could scrounge together to purchase a piece of heaven. World famous eh? 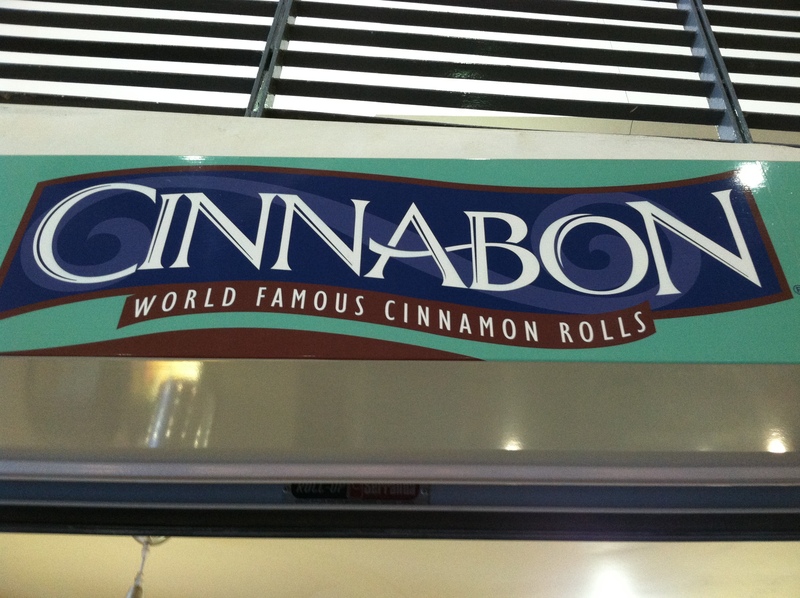 Too bad the world of Ghana has yet to understand and grasp the amazingness that is Cinnabon, however thankfully South Africa has. We got a 6 pack of Cinnabon for the family I was staying with however, my greedy self wanted my own. So what did I do, I bought a Cinnabon Classic. Something I could never eat one of on my own at home and I usually ended up giving the rest to my dad or brother. However today was different. Something in you changes when you know you will not get to taste something like this again for a long while (or at least for the next 30 days before you go home for Christmas). It had been too long though, too long since my mouth had something so sweet and delicious. You think this would be the end of the story however it gets worse. My friend then asked me on the way home “Were you really serious about wanting to stop and buy some McDonalds Sweet & Sour sauce?” and I said “Serious as a heart attack.” There we went pulling into the closest McDonalds (Which warmed my heart to simply see, because Ghana has yet to catch on to the phenomenon as well). I NEVER eat McDonalds back in the States unless I am working at camp and hating my sandwiches packed each day for me, or unless I find myself at home in Ohio and my dad and I want to try to win Monopoly pieces at the rare shot we win the cash or the car. Often times we would swing through the drive-thru window simply because my mom had a coupon for free fries or something crazy like that. I am telling you people…something changes in you when you see something you know you won’t have back in your country. Something barbaric like that animal instinct rises up in you that makes you leap on your prey and devour it now! So. I. Did. Don’t judge me this is a judgement free zone people. I marched up to the counter and said to my friend, I am going to have to order something at least but it is 10 a.m. and they won’t be serving french fries now. Sure enough though the men in front of me had a large french fry on his tray. Yes. This. Is. Real. Life. This actually happened just now in South Africa. My friend stood laughing at me. I said you might laugh now but when you are back in Ghana and I roll up to the Peter Pan restaurant with my own sauce, don’t hate, and don’t be jealous and most certainly don’t ask to borrow any. The thing about Ghana is that they are huge into Chicken and rice. EVERYWHERE. However their sauce options don’t exist and if they do you must pay out the ear just to have some extra ketchup (ok, ok it is like $.05 but still i find it crazy to pay for extra ketchup when places back home will gladly hand you 20 packets that sit in your car for the next year). So I am sorry that I am NOT sorry but I had to. I just had to eat Cinnabon and get McDonald’s Sweet & Sour sauce. Ghana I will see you tonight. Armed with Granola bars, Biltong (Beef Jerky from South Africa), Marshmallows, McDonalds Sweet & Sour sauce, Tea, and many other great things your country will overcharge me for or not even offer in the grocery stores. South Africa it was good while it lasted and thank you for comforting my Ex-Pat heart for the past week. The past two months have been a whirlwind with school well underway, afterschool activities, and much more going on here in Accra. With that said though there is no excuse for my silence over the past two months. I am sorry if you feel like we had a bad break up and I am that awful ex that has not returned your phone calls, texts, or Facebook messages. No worries I am here to rectify that situation and update you all on life here in Ghana. Playing in a basketball tournament where you are only one of two females (the other being one of your closest friends in Ghana), however showing other girls that they too can play with the guys. It raised a lot of questions and encouraged female spectators to ask questions. Married folks who are farther along in the journey of life who take you in as their own child, have you over for dinner, and give you advice. I am particularly grateful for one couple that does this frequently and for that I am eternally grateful for their love and support. My friend Mallory’s laugh…it is the best and once she gets started she can’t stop and it always is contagious and gets me laughing. Packages from loved ones back home. Reuniting with a close friend who you have not seen in nearly 10 years. I want to challenge you all that as you go throughout your next full day, look around, soak it all in, and see what simple and extreme things are you thankful for. You would be surprised. Trust me as a girl who used to take consistent electricity for granted, I am thankful that when I flip the light switch and it actually turns on, I am impressed. I am also thankful for those little moments when I am sitting around a meal with close friends and everyone is smiling. Don’t let life simply pass you by. Most of all, be thankful. I love American International School. I work with a lot of the upperclassmen and they have quickly stolen my heart. Do not tell them that, I need to maintain some sort of authority figure in their life. I love my seniors; I want them to grow closer to God and experience Him in a new and fresh way like never before. I want them to attend college/university and see them achieve their dreams. I want the world for them, much like a parent feels I am sure of wanting the best for their child. We laugh a lot, we do life, and they are real with me. For that I am grateful. 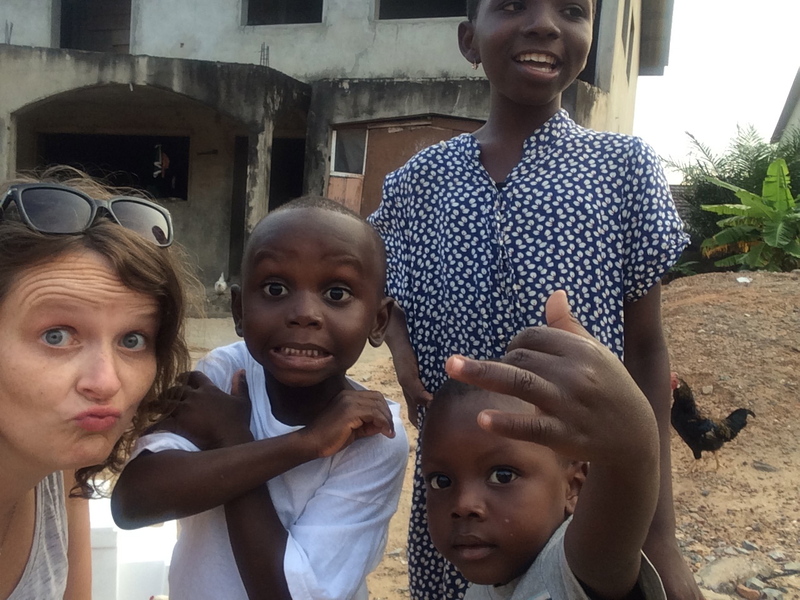 NATALIE BULLOCK IS COMING TO GHANA! I am pretty sure she has not even announced it publicly; so let me give you the E! True Hollywood update: We had an opening for an ESL/ELL secondary position. I called Nat and told her about the job opening. She sincerely needed to pray about it and gain some clarity (meanwhile I have a direct line with Jesus (you know since He is a buckeye and I am a buckeye) and He had already told me that she needed to come to Ghana). Long and Short of it, is that she is going to do a one year contract and come here to AIS for the school year. I am thrilled that she will be joining me here as soon as her visa is issued. We have not lived in the same country for 4 ½ years and we have not lived together since college, which has been a few years as well. Cannot wait for a little slice of home to arrive. I had a REAL HAMBURGER! There is a great restaurant here called Cuzzy Brothers, it has a South African twist to it (which you all know I love my South African friends and their food). The place has great food and an amazing atmosphere that makes you feel like you are not in Ghana. I am playing basketball every Tuesday night at another school here in Accra. I have met some really neat people from all over the world. I am so stoked to be playing basketball again regularly. I can thank my sweet friend Mary for inviting Emily and I to play. Mary and her husband continually lookout for me while I am here in Ghana. I am blessed to have them in my life, and also they have such stinkin cute kids! My friend Emily and I are playing in a charity basketball tournament this weekend! Some of the folks we play with on Tuesday nights invited us to play in the tournament with them. We are so pumped! I am traveling to Budapest, Hungary for a week before returning to the States in December. A Simple re-routing of my ticket has allowed me the blessing of doing so and an opportunity of a lifetime. 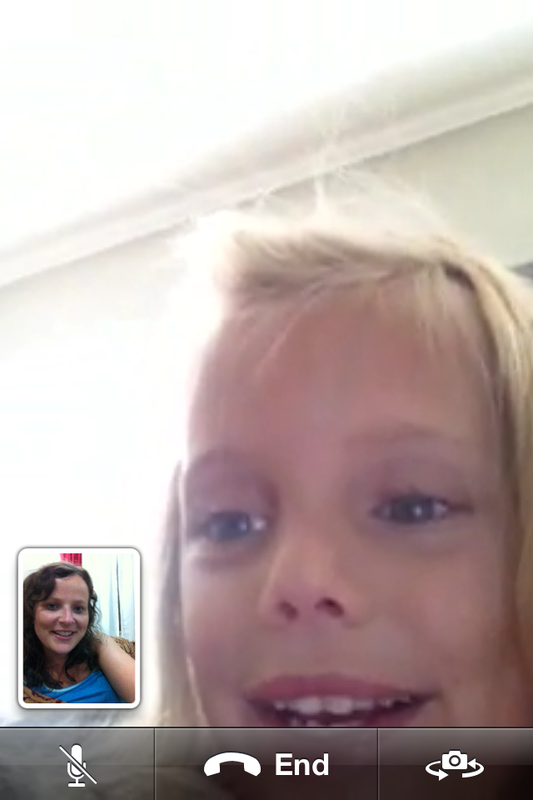 I was able to face-time with the Foster’s kids on their first day of school! Although it was much like watching the blare witch project movie with the camera shaking constantly, I was so thrilled to see their precious faces and hear all their stories from their first day, and the end of summer shenanigans like Young Life family camp at Rockbridge. 10. Some of us went to a street art festival called “Chale Wote” which means “Man, Let’s Go” and also the same term is used for slippers/flip flops (the old navy $3 kind) worn on your feet. It was fun watching some graffiti artists do their thing, checking out local food vendors, and craftsmen/women. I bought some amazing pottery, a handmade wallet made from the beautiful Ghanaian fabrics, and some local honey. It was overall a good day! 11. My friend Kate (Kate the Great as I like to call her) and I played some Frisbee and taught one of the guards how to throw a Frisbee. We were waiting to go play Frisbee with the same crowd from Tuesday night basketball, however a massive rainstorm blew through and Frisbee was canceled. This turned into the best Sunday afternoon in a while because Kate, Emily, and I just sat on the front porch, laughed, played music, and talked honest about life. Oh and it was a major bonus that Emily made some homemade chocolate chip oatmeal cookies while we were porching it during the rainstorm. 12. James installed a.k.a nailed a board to the bottom of my office door, therefore PREVENTING THE RAT from coming into my office (and also James & Andy’s office). The rat was becoming quite annoying. He had been spotted in action twice. Andy preached a sermon one Sunday at church about not hesitating, not procrastinating, and he shared story about these toilet roll holders he had in his house through three moves but never hung them. Feeling guilty before preaching the sermon that Sunday, he installed them, and it only took him 3 minutes to do so. That Monday at school I said good sermon Andy, now we must not procrastinate on this Rat thing, because the three of us had devising plans and ways we needed to trap, kill, or exterminate the rat, yet none of us had done anything about it. 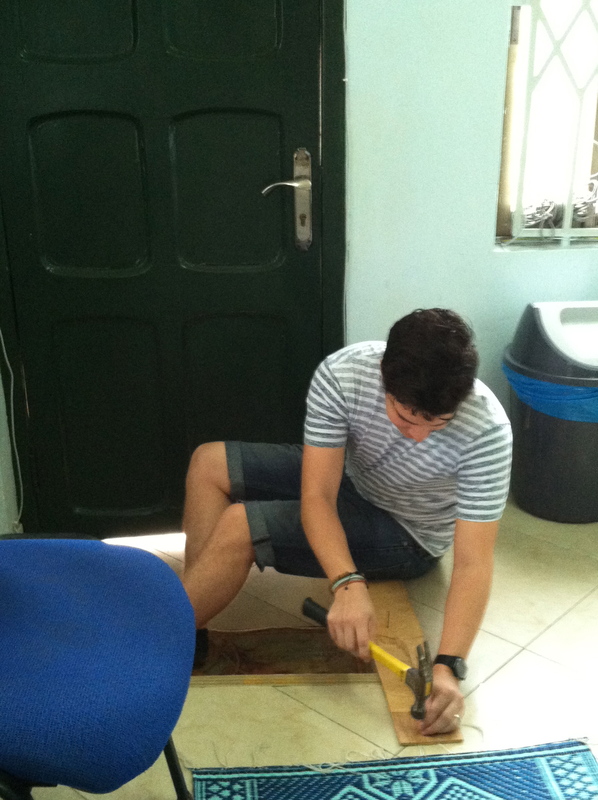 Haha, so therefore I went and got a board from my house, and James willingly nailed it to the door. We have not seen any traces of the rat since. Booyah Ratatouille. 13. 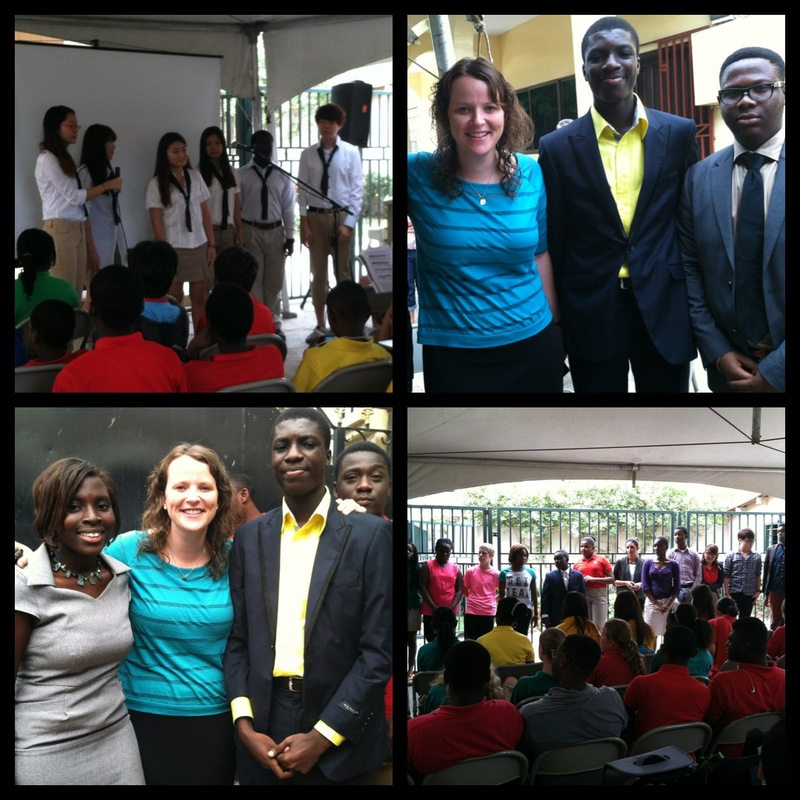 We had open house here at American International School and it was awesome. Our theme this year is renewal and boy are we getting some fresh wind in our sails here at AIS this year. I am truly blessed to work with such amazing people. The best part about open house is that we were able to rock these sweet hats that a former student designs. His company is making signature AIS hats for us. We were promoting them and of course, I LOVED rockin the sweet AIS swag. 14. One of the American stores here had SUNCHIPS! Haha it is the little things in life right? Well I was running errands for our senior snack shack, and I turned and saw them! SUNCHIPS, Harvey Cheddar particularly (despite Garden Harvey being my favorite), I WAS THRILLED. Yes, they were more expensive than in the States, but you know what at that moment I did not care in the least bit. It was worth the money, just like it has been worth the money to buy Pringles when I see them as well. These things I would hardly ever eat in the States are a taste of home. It is like I am Charlie finding the golden ticket in the Wonka bar! I GOT A GOLDEN TICKET. I GOT A BAG OF SUNCHIPS! 16. Encouraging e-mails, blips, face time calls, Skype dates, texts, snap chats, or whatever avenue of technology you care to insert here. I cannot even begin to list the people whose “random” messages have made my day. Keep them coming! The Holy Spirit works in crazy ways. It is always on days where I am thinking “I miss ________” or “I miss doing _______” that I receive something that makes me laugh or smile from someone back home. 17. 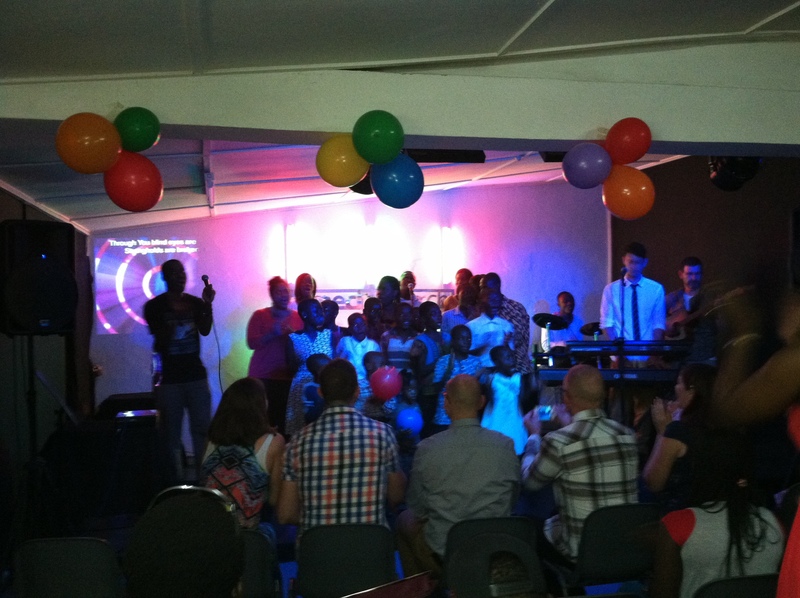 Hope City Church. This is the church that I have been visiting and I am pretty sure I will call home while here in Accra. I am thankful for their patience as I navigate and pray through trying to find a place to call home. I know I will jump in and serve and be involved as soon as I call it home because I genuinely miss that. I miss Blue Ridge Community Church in Virginia and I miss New Life Church in Ohio. Church looks different everywhere in the world. This I know. Hope City is comprised of some really amazing people with real life change. They are raw and genuine, that is what reminds me of the two churches mentioned prior. Yes, things might look different but one thing remains, both places genuinely love Jesus Christ and want to see Him be known and that is all that matters. Thank you Hope City for serving the people of Accra. 18. Cheap fruit and veggies! I love fresh fruit and it has been glorious being able to buy fresh pineapples for like $.75 cents American. I bought like 12 bananas at the market on Saturday for 1 Cedi. That is $.50 PEOPLE! 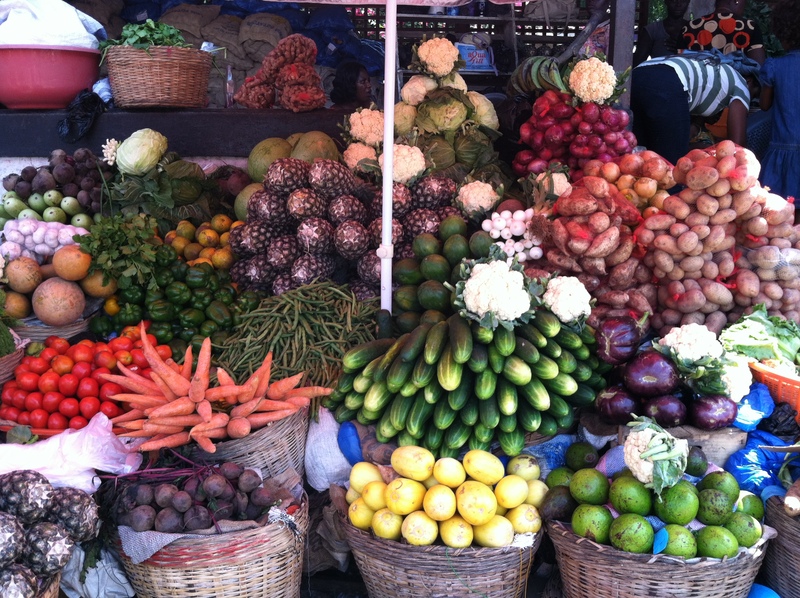 Plantains, tomatoes, peppers, onions, bananas, avocados, mango, papaya, passion fruit, you name it! I am keeping the local fruit and veggie stands in business. 19. WE HAVE MONDAY OFF SCHOOL! I could not be more excited for an extended weekend. 20. I will wrap this up soon I promise. I want to end on quality friendships. God is at work here in Accra. He is working in and through me. Continuing to refine and purify me in this process of life. In the mean time He has given me some amazing people to do life with. You all know who you are. The year is young and I am sure I will go deeper and wider with more folks as the year progresses. However for those of you, who have taken the time to go deep in our few short months here, thank you! Thank you for laughs. Thank you for tears. Thank you for hot chocolate dates. Thank you for smoothie dates. Thank you for cider dates. Thank you for front porch sittin during a thunderstorm. Thank you for sharing in my “ghetto” past (and showing me pictures of yours). Thank you for inviting me to play basketball. Thank you for loving me long before PFO and preparing me for this great adventure. Thank you for late night talks and laughs until 2 a.m. Thank you for ukulele jam sessions. Thank you for trusting me. 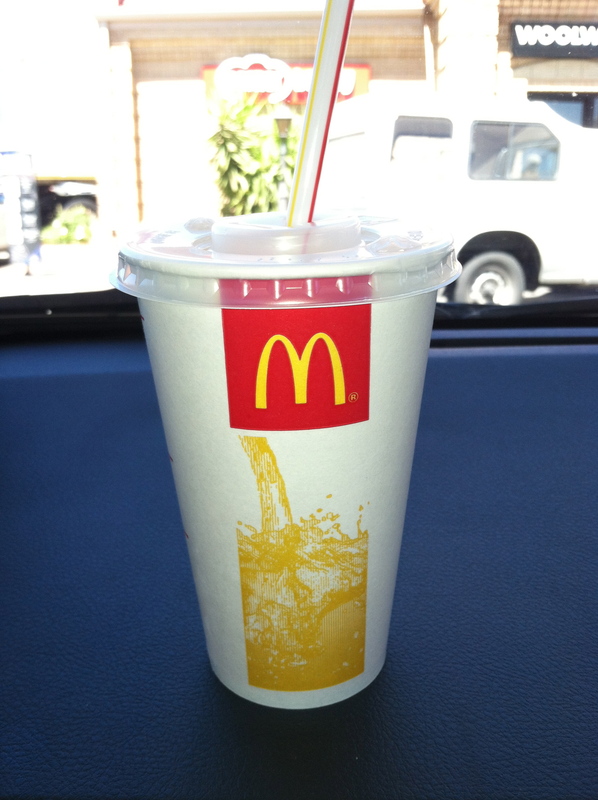 Thank you for your hospitality when having malaria. Thank you for weak Kool-Aid, sugar popcorn, and family movie nights. Thank you for loving me well thus far during my time here in Ghana. I am eternally grateful for each one of your friendships. I am blessed to do life with some pretty rad folks here at AIS. There are definitely some great things going on over here. I am blessed to be living this life. I had been warned that these days would eventually come. I refused to believe they would. I vowed I would not let the devil get a foothold in my thought process. 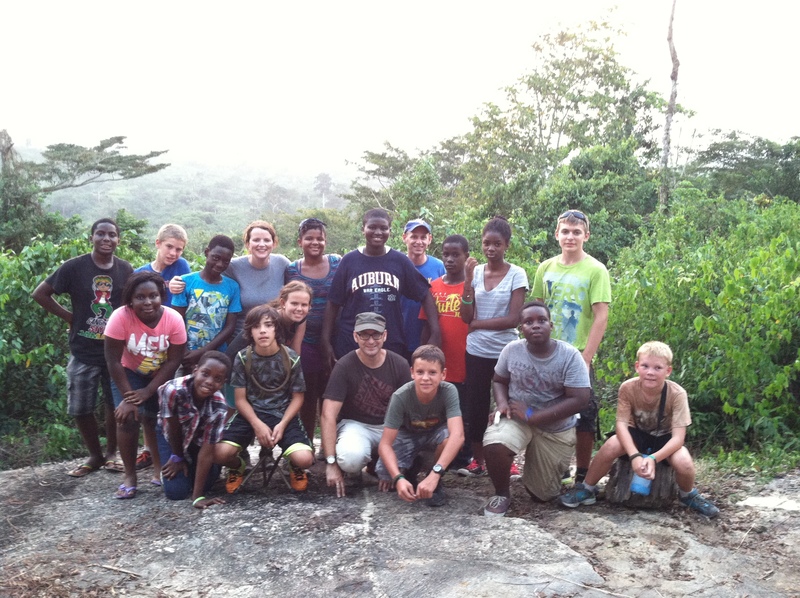 Satan would not win during my time in Ghana. However then yesterday occurred. My love/hate day with Africa. I left for church with one of my roommates, while the other two went to their church service. It was a great Sunday at Hope City because it was their 2-year anniversary service. The place was packed; there were smiles, and a great time of worship. They even had food afterwards (which you know I am always sold if there is free food). I immediately told Laura (my other roommate that was with me) and we decided to skip the dessert and get a taxi home immediately (You know it was serious if I am skipping out on dessert people). We called our roommates to get the full story. We arrived and discovered that someone had climbed over our back wall (yes, even over the razor wire and tall walls), then they had managed to put a ladder up to Christy’s bathroom window, and gained access that way. They rummaged through the rooms on that side of the house and exited via our back door (which we later realized was unlocked and open, and this door is like FORT KNOX, it takes 4 turns on the deadbolt and 3 turns on the bottom key lock to unlock this thing). That was it, the devil had gained a foothold. I was frustrated, annoyed, and overall the Madea, inner black woman was rising in me. I believe I said, “just give me a gun and I will guard my own house.” This entire situation had sent me over the edge because just Thursday night, after our school open house, some teachers and myself had gone across the street and had dinner together. Upon walking home (which is back across the street) my friends went into their gate, I walked down one to mine, which was where my friends, Emily & Mallory dropped me and kept walking to their apartment up a ways. I noticed there was a man sitting outside our gate (which is completely normal, there is always someone sitting on this make shift cement cylinder thing that acts as a community park bench almost). I rang our bell and waited on our guard to let me in. He was taking his sweet time (seriously this man has the reaction time of a fat kid on the 4×400 Olympic relay team). However while I was waiting on him to open the gate, out of NOWHERE, seven different men converged on this one man. They began to accuse him of surveying the street, our house, and being good for nothing. They were shouting at him, and I said, “Why are you harassing this man?” and they replied with “Because he has been sitting here for 5 hours and has done nothing but watch us and you.” Finally our guard opened the gate and I told him that he might want to stand out here because there was a situation and it was about to GO DOWN (I mean like GO DOWN, like gangs of New York go down and hindsight I think the language barrier was present because I am pretty sure my Ghana guard doesn’t use the slang “It’s going down”). I went inside and dropped my stuff off, yelled for Laura to come join me (I figured two mid-west, white females were nothing to be messed with at this hour of the night). At this point I had texted two of my male friends who had been with us that night and lived next door to us. One of which I thought would come ready to pistol whip anyone, doing anything outside our house because he is Latino, a former gang member, and despite me thinking I have street cred, he has legit street cred. However to my surprise my British friend is the one who offered back up. I heard his front door slam, and saw his tall head above the wall marching out front of the gate. I figured this was going to be entertaining. 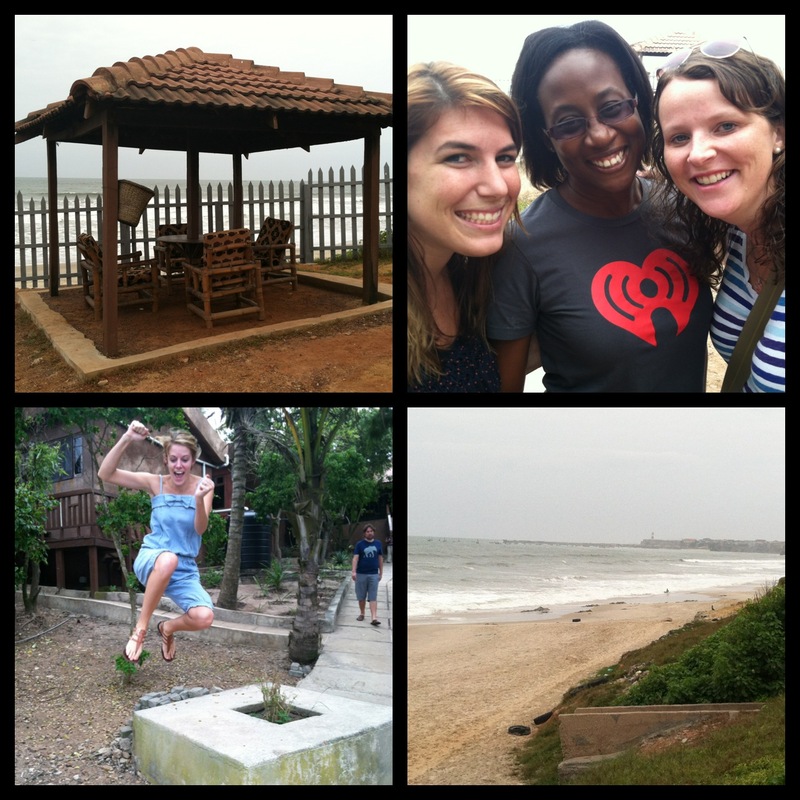 Pete, my tall, white British friend, Laura & I (two mid-west white girls), Our guard, the random man being accused, and 7 random Ghanaian “neighbors” all trying to problem solve and quiet things down. Honestly Jerry Springer had NOTHING ON us that night. Before I could make it out the front door, I realized Laura had already taken off and busted out of our front gate yelling “Hey you!” and then she realized that our British friend, Pete, was already handling the situation. Meanwhile our “guard,” and I use that term loosely, because I am pretty sure a Girl Scout den mother would be more successful at guarding our house than he would simply standing there watching. HE. NEVER. SAID. A. SINGLE. WORD. Pete finally talked all of the men down, sent the one man on his way. Our neighbors said they will continue to keep an eye out (that is what everyone does, they know the daily routine of our street, they know when something is out of place, or someone does not belong), and Pete then proceeded to give our guard a nice talking to regarding how he needed to be performing his job. Ok so now that you have the backstory with the current situation on Sunday afternoon, you can see why my frustration was mounting. After the break in, we called our business office manager and she went to the police. Our roommate filled out a statement and to our surprise they actually had a “corporal” that was available in 15 minutes to come “investigate,” once again I use that term loosely because I am pretty sure our 4th graders at school in the science club would do a better job investigating than the inspector gadget wannabe that turned up at our house to gather information and look around. While the investigator was there (who showed up in blue jeans and random polo type shirt, with a pad of paper armed with a pen), the power went out. SWEET GLORY! The devil was once again waging war with me, and my roomies. Power outages are no big deal, we can handle those, it just happened to be our week though to host our member care group. This means all staff show up at our house to eat and fellowship. Member care was starting in two hours. I quickly gathered all my ingredients and went to the apartment complex where some of the other staff live, and cooked at a friend’s house. With about 15 minutes until care group was starting, my friend Mallory and I walked back to my house. Praise the Lord the power had returned (this was huge because usually it stays out for at least 4 hours at a time). People were soon gathering and all was well in the world again because we had food and each other. Thank you for bearing with me on this long one. I apologize if I lost half of you on the second paragraph. Oh and the icing on the cake is that all of this was going down while I am covered from the waste down with bites on my legs. Not sure what they are but hopefully some hydrocortisone will do the trick. Bottom line & lesson learned: THE DEVIL IS A LIAR! He is definitely out to steal, kill, and destroy any good that is happening here in Accra. I have had multiple conversations with co-workers here, saying that despite the staff last year banning together and battling the mental stuff from the events last year, the devil is waging war this year personally. Health wise we have had staff hospitalized (Please be praying for Rebecca who is currently still in the hospital with a bacterial infection), we have had an epidemic outbreak of malaria among our staff, bronchitis, e-coli, colds, chest pains that were similar of heart attack symptoms, the usual stomach issues, fevers, vomiting, you name it and I am pretty sure someone has dealt with it in our few short months here. We have had multiple houses broken into, cars break down, and staff going through things with family back home. I mention all of these things not say, “woe are we,” but to say, PRAY PEOPLE! I firmly believe that the devil wants to see American International School divided, struck down, and destroyed. Please pray against that. Pray for health. Pray for unity. Pray for safety. Pray for rest. Pray for endurance. The staff here at AIS is among the best. I have the utmost respect for the people I work with. They are strong, God-fearing, Holy Spirit led, encouraging, and praying people. Okay, I lied there are a few words in this post but mostly pictures. I feel the need to go a ways back and update you all on some fun things and not so fun things. 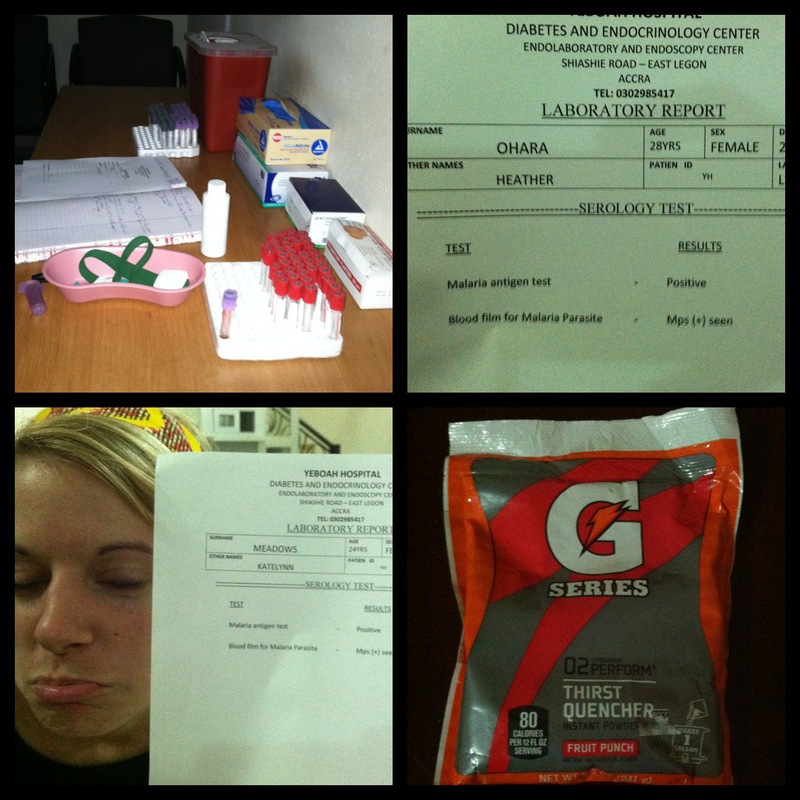 I did not have any energy while I was sick, so I apologize for the lapse of blog posts. Now that I am feeling more myself and only struggling with an annoying cough, time to get back at it. Enjoy! 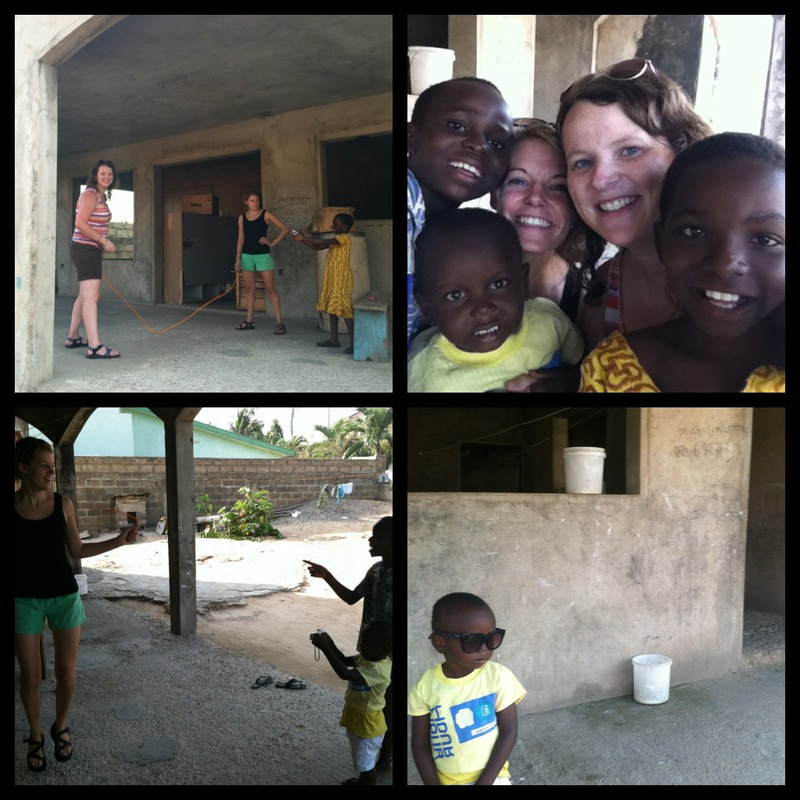 Before we both got sick, Kate bought a jump-rope at the market and we went and hung out with some of our neighbors. This sweet family brought a smile to my face. Two boys and two girls in the family. The bottom right is little Solomon, he looked so fly in Kate’s sunglasses we just had to snap a picture. We played, we competed, we sang, we laughed, the kids enjoyed taking pictures with our cameras and phones. It was fun to meet them because they literally live directly behind my house. Sweet Lisa & Kate introduced Laura and I to Krystle’s, it is a great pastry and smoothie shop. The bonus is there is a lady who sells sugar popcorn and salt popcorn for only 1 cedi (50 cents) right next to the smoothie stand. Then you can sit and enjoy your smoothie, popcorn and company. 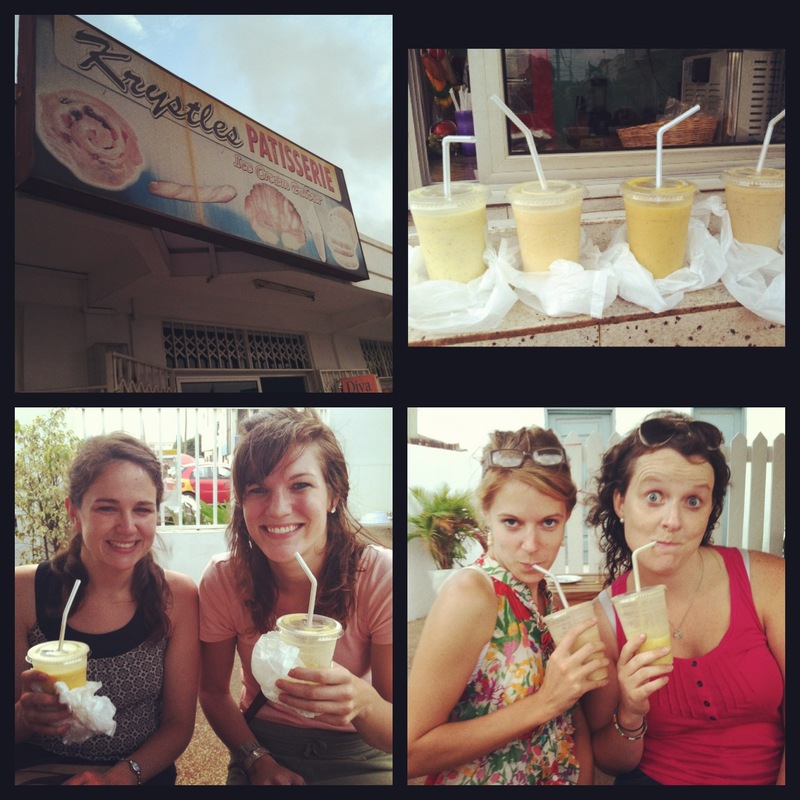 I had the passionfruit & pineapple smoothie and it was UHHHMAZING! 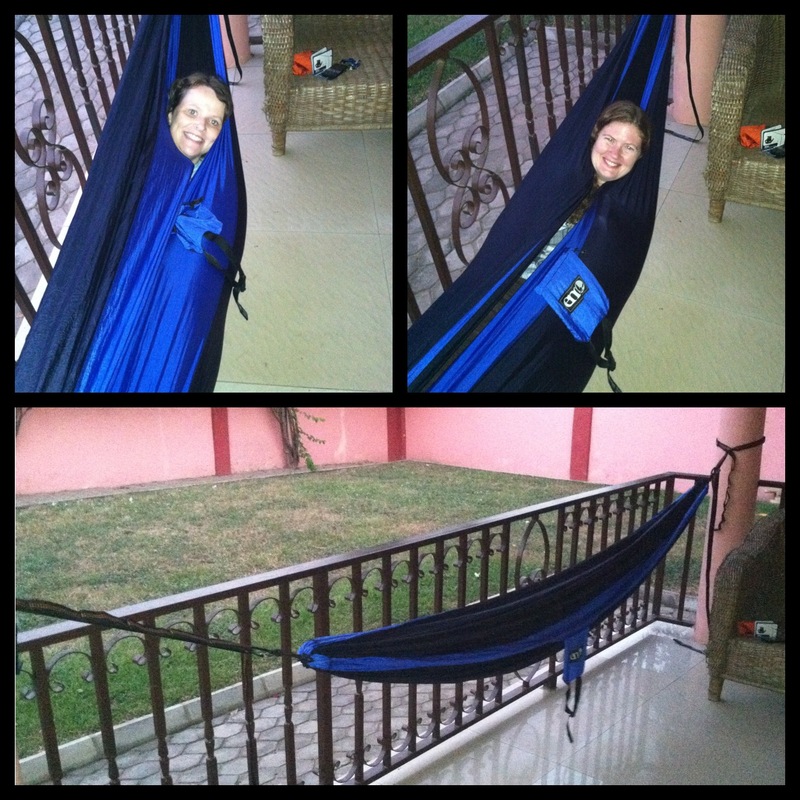 I finally was able to string up my hammock that I brought with me. It was glorious and I was very thankful that I had the extension straps as well because our pillars at our house are very far apart. Christy and I both got some good use out of it (I also got a massive mosquito bite this night, which leads me to my next photo). Sadly After round 1 of medicines and tests, Becca and I went back to get tested again to make sure we were in the clear. We also took Kate with us this time because she was not feeling well either. This began the decline of the majority of AIS staff. Within a matter of a few weeks more than 12 of our staff and a few students had Malaria and some sort of other combination. 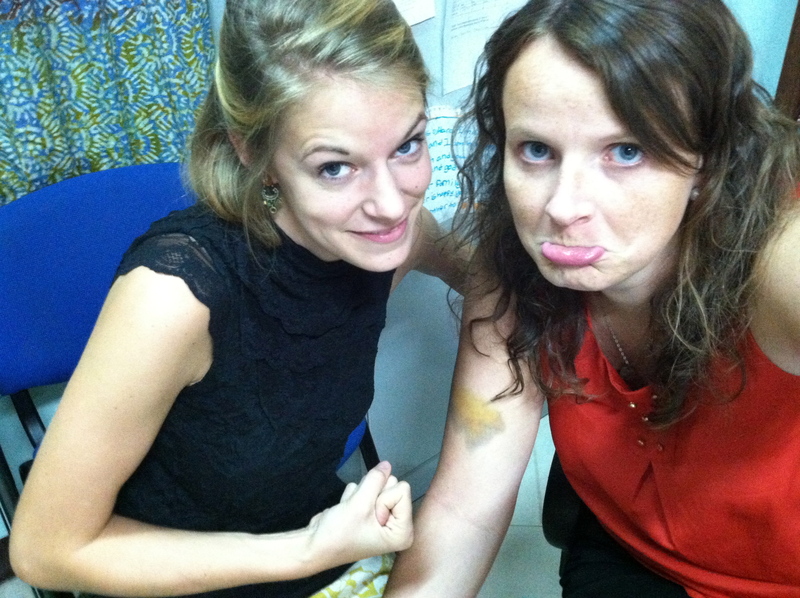 My friend Kim said in her four years here she had NEVER seen this many staff with Malaria. This was Kate and I getting our results back stating that I still had Malaria and that she had come down with it herself. Also after a week of Malaria and finding out you still had it, I was needing some electrolytes and my buddy Pete came through in the clutch and hooked me up with a massive bag of gatorade, which I ended up making about 4 liters out of that one bag. It was glorious. I only took one day off from school and spent the weekend recovering. Then it was back to school on Monday and pressing on. We had student counsel elections. A few of my seniors that are in my College Prep class were running for various positions. The twins (Fanny & Fabrice) who are in the bottom left picture, ended up sweeping the President and Vice President for student counsel. Things started going up from here. My body finally began to feel like itself again. The only thing I am still dealing with is an annoying cough. I am trying to get back into good condition, where I am not out of breath hiking to my 5th floor classroom when I have to teach my College Prep class. I will get there, I need to get there, because I am starting to play pick-up basketball on Tuesday nights. I can’t be “that girl” who is out of shape. Worst case scenario I will take a few hits of that inhaler the doctor gave me. No worries though I am taking it easy and working my way back into things. So we were all told that we had to have these Ghana Identification cards. It apparently was super important, but there was a lot of confusion on who needed them and why. Then the day before the deadline to get them, we were informed that it was a must. It costs each one of us employees $120 American Dollars. 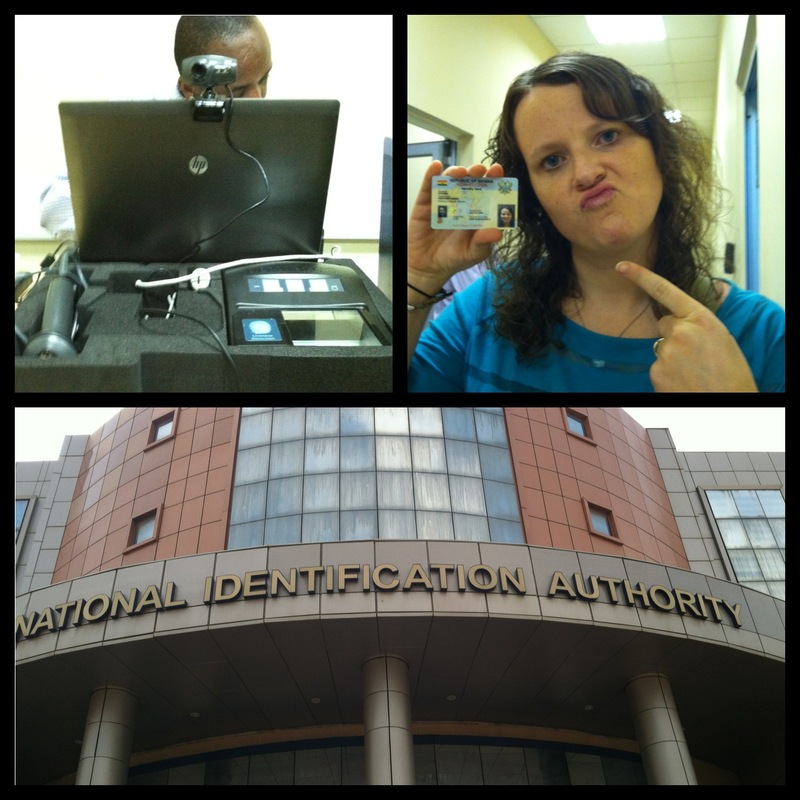 We took turns all making trips to the National Identification Authority building. Once you got there it was like organizing a cat parade. It was awful, mass chaos, all kinds of random people and lines. Luckily when I went, I went with out director, she is a lady who handles her business well. She marched right back to this back room, where we sat down, waited and waited some more. Her face must read to the Ghanians “You better call my name next” because she had hardly sat down and they called her and her daughter back to get their cards. I unfortunately must have had the wrong thing written on my forehead that morning because I sat, and sat, and sat some more. The people watching was at a prime. Two nuns walk in, 2 Ghana military personnel walk in to the room, 6 Asians, 1 Russian, and 3 Americans, no no people this is not a bad joke…THIS WAS REAL LIFE. I promise you. Finally I was given my card. I am official. Officially a non-citizen of Ghana, and I need a card to tell people that (As if my porcelain skin does not already tell them that I am not a citizen), but hey what the heck it is a cool looking card at least. All of these updates bring me to this past week and weekend. 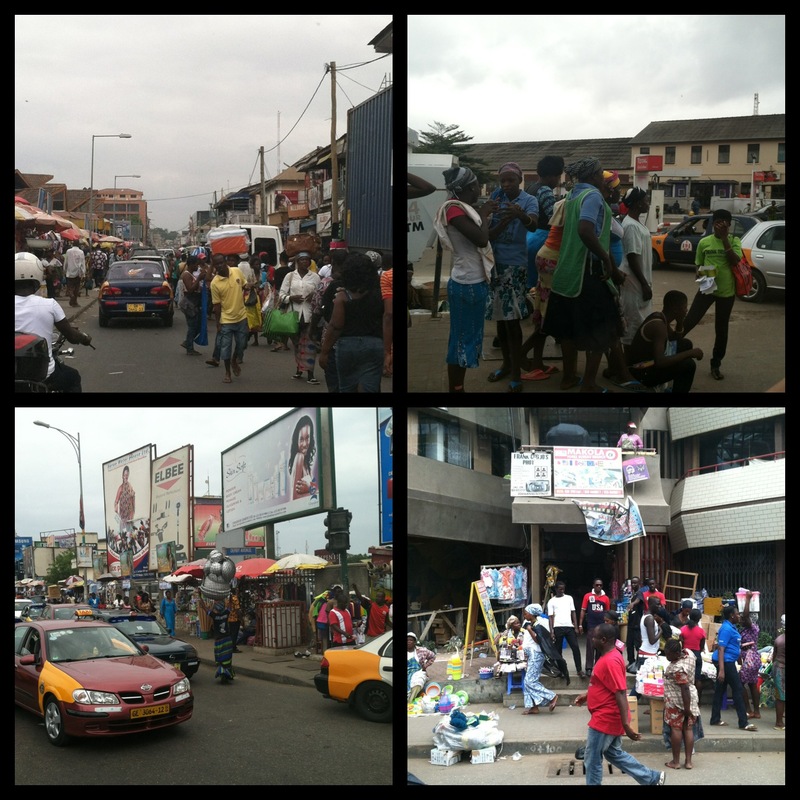 We took a bus tour Saturday all over the city of Accra. One of our teacher’s husband is a professor and great lector. 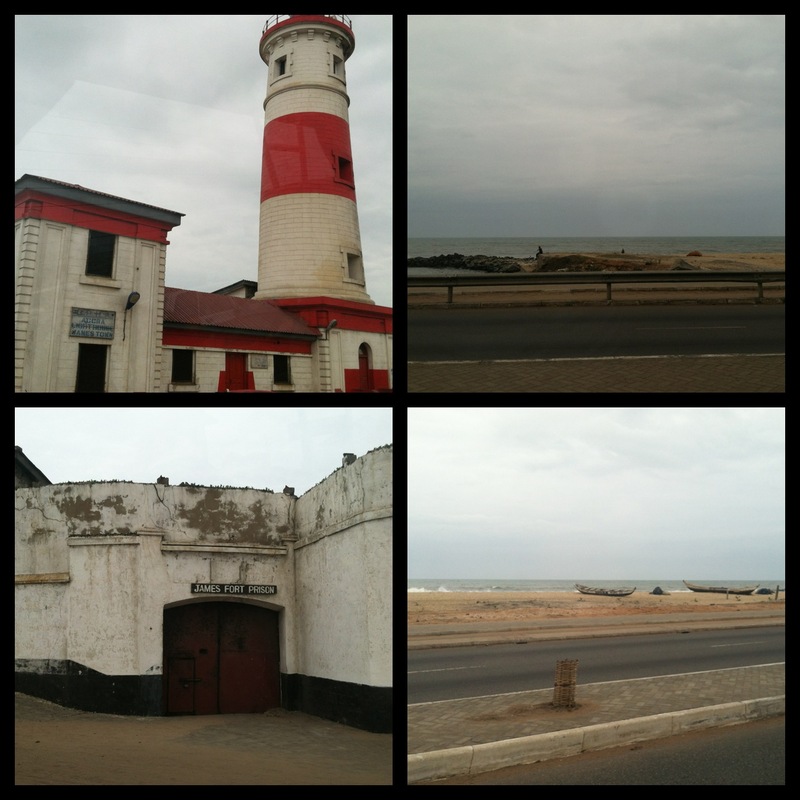 He gave us a tour of the city and explained the history behind a lot of Accra. 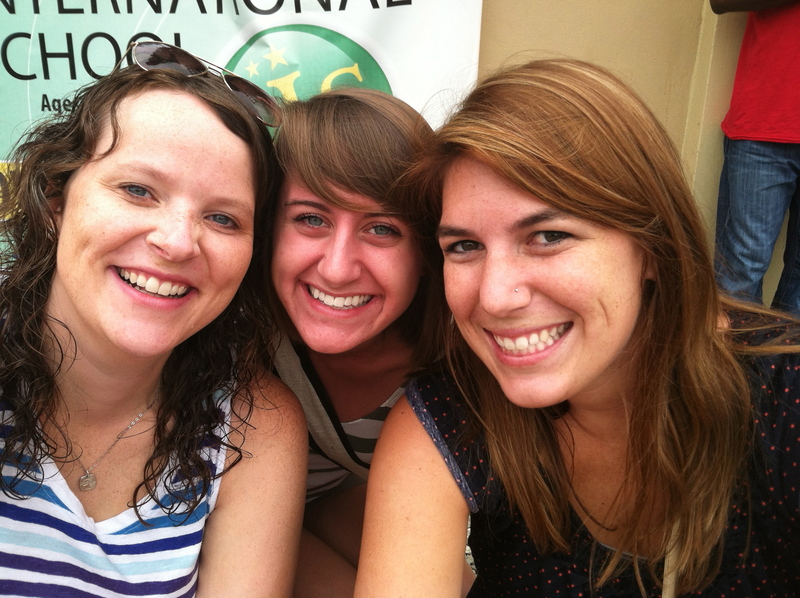 This is Mallory, Emily and I before the tour began. Love these girls. So blessed by the laughs, honest chats, and good times we share. 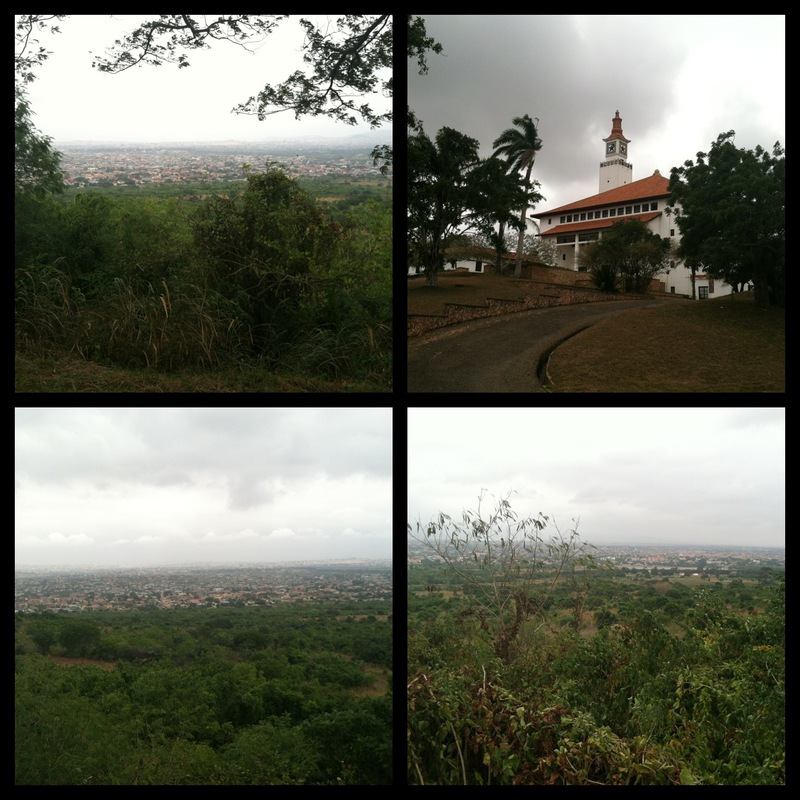 We drove on to the University of Ghana’s campus and went to the top lookout point. You can look out and see the entire sprawling city of Accra. We drove all over the city. The good parts of town, the not so good parts of town. We literally drove through the Makola market. Which is even more bustling and busy than the Madena Market. 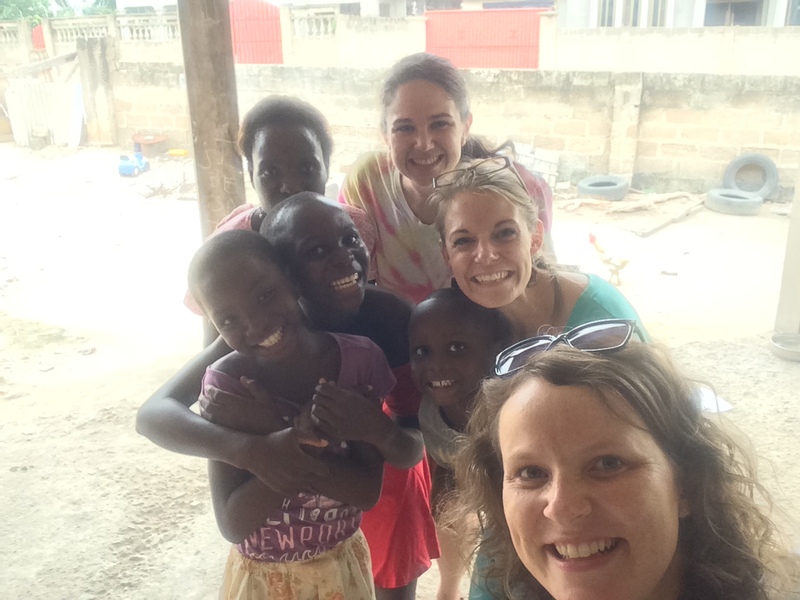 Dr. Tawiah said the girls on the top right of the picture travel from their villages into the city to work. They get paid to carry things on their heads for people, you can hire them to do so. He said many of them prefer the city life and working hard in Accra, rather than their villages. We then traveled on to Jamestown. This is a coastal city. The same coastline that all of the waste from the city of Accra is dumped into the ocean. Yep, we saw that area, and smelled it to. It explains why that beach area is dirty looking. We passed the famous Jamestown lighthouse. Saw some of the historical salve trade ports. We drove past the James Fort Prison that was used a very long time ago. We ended up at a hotel in Jamestown, that we stopped and ate lunch at after the tour. The restaurant was called Tribes and while we were waiting on our food (which takes a while in Ghana), we decided to go exploring down by the beach (No worries this was down quite a ways from the dumping grounds). A few things I love about the picture above. Kate and her romper, also doing a ninja jump off of that concrete square (what you don’t see is the fact that there were like 4 other british kids doing the same thing. Kate felt the need to join and I felt the need to photograph this experience. Also I love the picture of Lynn, Emily, and I. I will get up to more trouble with these two than the rest of the bunch, I can tell already just by our weekend shenanigans. Exhibit A: This picture. It took us about 50 attempts to get this final shot. Lynn promised to finally get in the picture with us “as long as her feet did not touch the poop water,” well unfortunately after we landed the tide had rolled in and our feet were covered with waste water from the ocean (despite the actual waste dropping site being a lot further away from us than where we were for this picture). Luckily none of us had open sores on our feet or legs so we were ok to have the water touching us. 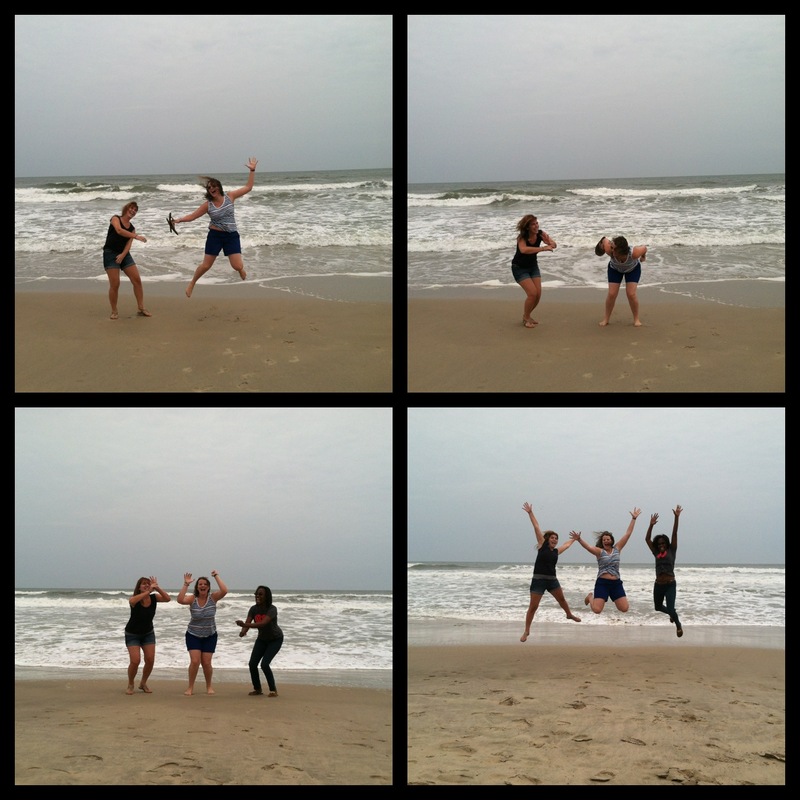 The top left photo is the perfect depiction of Emily and I’s friendship. 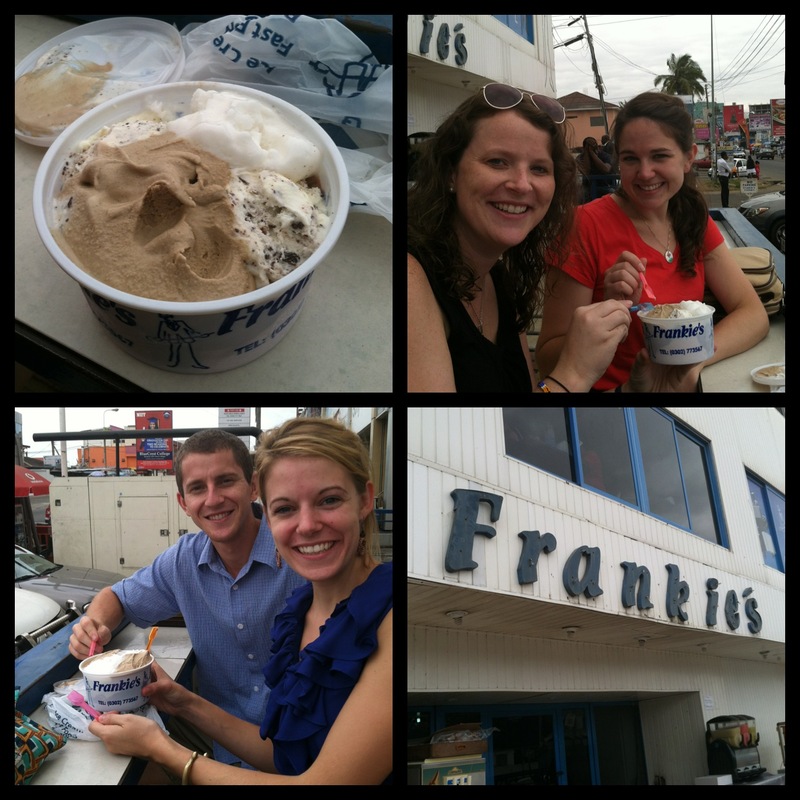 Last but not least, after church yesterday we went to a great Italian restaurant, and then went to Frankie’s for ice cream. I honestly could have skipped the pizza lunch and just ate this ice cream. We split two larges because it was 8 scoops for 12 Cedi or 2 scoops for 8 Cedi. I am not great with math but we were like why not split the large and pay 6 Cedi and we get more ice cream. WINNING! So we had two pales of ice cream and sampled away at all the flavors. Between the two larges we had strawberry, chocolate, stracitella (chocolate chip), lemon, coffee, mint, dark chocolate, and I am sure there was one more in there, but who knows. It was delicious and made up for the lack of good desserts in Ghana. I hope this has brought everyone up to speed. My sincerest apologize for not updating sooner. I feel like a piece of me was missing when I was not blogging updates to you all. Thank you all for the kinds words, prayers, encouragement, and love from all over the world while I was down with Malaria and what I like to call the black lung a.k.a. Bronchitis. I am still trying to get over the cough part, and I do still need to return to get tested to make sure I am in the clear for Malaria. However my theory is that if I am feeling myself again and the symptoms are gone after two rounds of heavy meds, then it is time to Rock and Roll and get back to life. In the words of the great philosopher M.C. Hammer (and most certainly with the Lord’s hand of protection) “CAN’T TOUCH THIS!” Time to get back into the swing of things for me.